AMTECH™ Pinch valve is suitable for corrosively liquors & slurries. 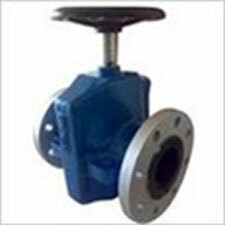 The valves efficiently handles clear liquids or gases. when the valve is open, flow resistant is negligible. there is absolutely no possibility of chocking of pinch valves. WORKING CONDITIONS Flanged as per BS 10 table D /Table E,Table F, ASA 150# etc. OPERATION Manually Handle wheeloperated/Pneumatic cylinder operated/Electric actuator operated.